Giving back to God is an expression of worship fundamental to His Kingdom. We see this from Adam and Eve having taught Cain and Abel about worshipping God with sacrificial offerings from their occupations, farmer and shepherd. And we demonstrate this fundamental understanding even on some subconscious level as we naturally want to give to those we love. Since we love God first and foremost, giving to Him comes naturally to us, too, as expressions of our love to Him. Where does your giving go? What does it do? Your sacrificial offerings to God through DCC supports the work of the church in reaching out in the Danforth, East Toronto and larger GTA, as well as across Canada and around the world through our Canadian and Global Workers. And we touch the lives of kids in our neighbourhood in a local after-school program, through ESL Conversation Circles, special outreach events and ministry opportunities, personal donations to a local food bank, general worship services and ministries to our regular attenders and so many who drop by during the week, as well as the maintenance and upkeep of this building and property for the proclamation of the Gospel. 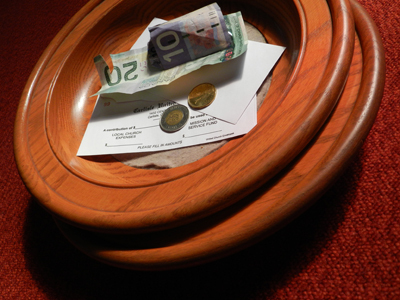 Give via the offering envelopes with cash, cheques or via the debit/credit terminal in the foyer (prior to service is preferred; insert your debit/credit print out into your offering envelope). Please use a giving envelope to record your designations and fill in your complete personal info to receive an annual charitable receipt. Note: Charitable receipts can only be made out to the name on the envelope. Use your bank's secure online banking website with the Interac e-transfer option to send your tithes, missions & designated offerings. Click below for instructions. Prefer to give right here, right now via our website? You can do so right now by clicking the button below. Thank you for your donations to the Lord's house and ministries at DCC! All online donations are securely processed through Stripe. Go to their page for more info if needed.